Fleur-de-lys bracket maker cufflinks, circa 1925. Last month I illustrated several pairs of beautiful cufflinks created by an unidentified maker who has been nicknamed the "Fleur-de-lys maker". The cufflinks are characterized by intricately engraved (engine turned) platinum or gold centers, bold borders and dramatic shapes. The moniker refers to the dramatic, flowing brackets the maker used to anchor the cross bars on the reverse of the cufflinks. Fleur-de-lys maker cufflinks, circa 1925. Identifying the maker of an unsigned pair of cufflinks can be a daunting task. Fortunately there are several directions in which to look for clues. 1. The first place to look is among signed cufflinks with similar decorative elements and motifs. Cufflinks with similar borders and central motifs may help identify the unknown maker, but caution should be exercised. Popular designs motifs were often embraced by more than one maker. 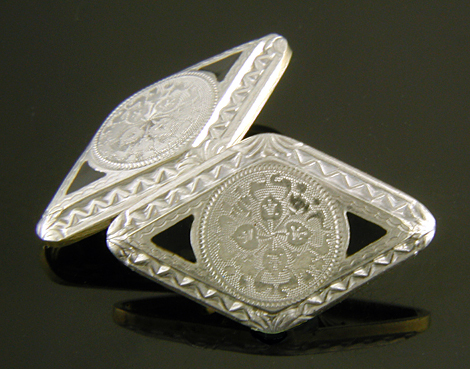 It is not uncommon to come across cufflinks with very similar borders and/or central designs that were created by two different makers. 2. The construction details and linkages of cufflinks can also provide clues. A hundred years ago cufflink makers took great care in designing both the decorative and working parts of their cufflinks. The emphasis was on creating beautiful, sturdy cufflinks that would pass the test of time. An earlier note on the cufflinks of Durand & Company illustrates the care taken in all aspects of cufflink design. Distinctive linkages, brackets and other working details may suggest the maker of an unsigned pair of cufflinks. But, here again, caution is advised. Bracket, crossbar and bridge designs may have been copied or used by more than one maker or may have been produced by a third manufacturer and sold as "findings" - parts to be used in the assembly of jewelry. The construction details of a cufflink may be a helpful clue in identifying the maker, but it may not be definitive. 3. Browsing through old jewelry catalogs and trade advertising is one of the pleasures of researching antique cufflinks. In addition to the inescapable charm of these period documents, you get a sense of how cufflinks were perceived, or at least presented, in the day. For purposes of identifying cufflinks the catalogs of jewelry manufacturers are the most helpful. The catalogs of jewelry retailers, while of interest in themsleves, rarely identified the makers of the cufflinks and other jewels offered. Unfortunately period catalogs and ads only document a small sampling of the the great variety of cufflinks that were created. It is rare that you will find an illustration of the specific cufflink you are researching. 4. Finally, patent filings for cufflinks are also a helpful source of information. Early patent filings included beautiful hand-drawn illustrations of the cufflinks from several angles and with the smallest details shown. In addition to the drawings, the patent filings included detailed descriptions that provide insight into the inventor's thought process and goals in creating the design. The earlier mentioned note on Durand & Company provides a wonderful example. Although none of these approaches alone may be definitive in attributing an unsigned pair of cufflinks, together they may suggest the maker or at the very least further avenues of research. Next month we will discuss several clues that may help us identify the Fleur-de-lys maker. Meanwhile I would love to hear from any readers with examples or knowledge of this maker's work. Recent additions to the Antique Cufflink Gallery include elegant two-tone cufflinks by Wordley, Allsopp & Bliss, a striking pair of cruciform cufflinks from the firm founded by Enos Richardson, and a trilogy of gem set links featuring Tiger Eye, White Chaledony and sultry red Carnelian. Radiant Scrolls Beautifully engraved centers with radiating waves surrounded by bold borders of twisting scrolls. A striking pair of Art Deco cufflinks. Crafted in 14kt yellow and white gold, circa 1925. Garden Maze A maze-like center of nested circles surrounded by borders of flowing scrolls and mille grain edges. The design brings to mind a maze at the center of a walled garden. Crafted in 14kt gold, circa 1925. Tiger Eyes Striking cufflinks with beautiful Tiger Eyes set in rose gold. The domed Tiger Eye cabochons are brown accented with and rich honey yellow "eyes." Created by Sansbury & Nellis in 14kt gold, circa 1920. Carnelian Red Sultry red Carnelains set in yellow gold cufflinks. Striking colors and boldly cut gemstones were hallmarks of the Art Deco era. Created by Charles Keller in 14kt gold, circa 1920. Art Deco White Translucent, foggy white chalcedonies (a fine grain variety of quartz) set in bright yellow gold bezels. A nice example of the luminous white jewels of the Art Deco era. Crafted in 14kt gold, circa 1930. Additions to the Antique and Estate Jewelry Gallery include a beautiful pair of stickpins by Alling & Company and Hans Brassler. Alling Dragon A fantastic winged creature with the head of a lion and body of a serpent coiled around a pearl. A nice example of the Victorian fascination with mythological creatures. Crafted in 14kt gold, circa 1890.